I was flying from London back home to Berlin on September the 11th 2016 . The flight was operated by British Airways. The airplane was located above Hankensbüttel / Wittingen (DE, Niedersachsen) when I observed a bright subsun and some bringt subparhelia. The suns altitude was about 40° at this time. For this fact the halos appeared very steep below the horizon, which made it difficult to observe them. In addition to the subsun and the left subparhelion, the sub parhelic circle was visible for some moments. It appeared in the shape of a bright tail of the subparhelion. But for some moments I could see the sub parhelic circle between them. The following image was taken with a Samsung smartphone. 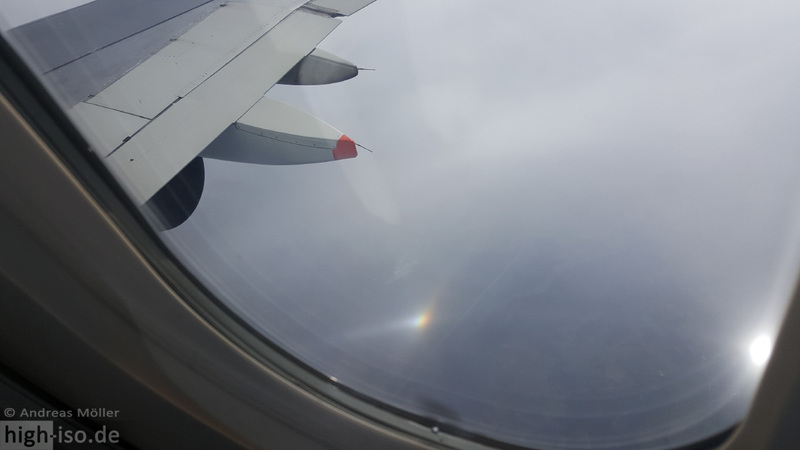 According to the theory, the sub parhelic circle can be produced by horizontal oriented ice crystals. But the sub parhelic circle grows left and right from the subparhelia, so that there is actually a gap between the both subparhelia. 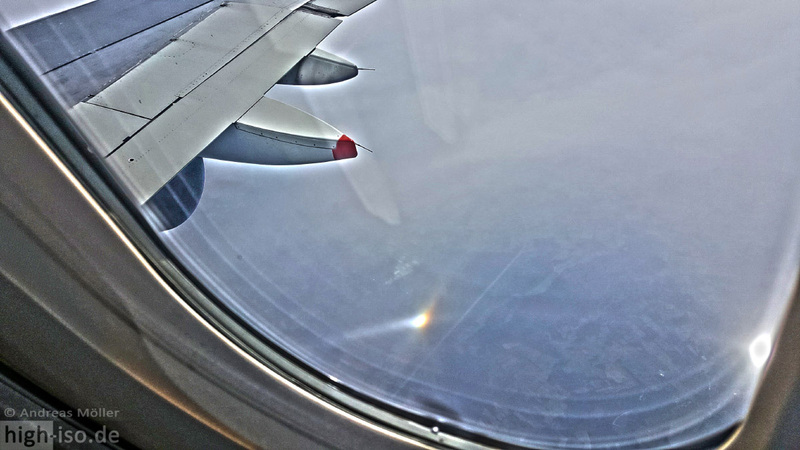 During my observation from the airplane, the sub parhelic circle was visible between the both subparhelia. How is it possible? The simulation software called “HaloSim” (L. Cowley & M. Schrieder) leads to a first clue. The sub parhelic circle between the subparhelia could only be simulated with the help of pretty flat Lowitz-oriented crystals. In addition, the simulation shows an “X” which is crossing each of the subparhelia. These are the reflected lowitz arcs or also knows as “Schulthess bows”. The bows are also visible in my picture from September the 11th 2016. The 1th picture shows a simulation by HaloSim (L. Cowley & M. Schroeder). The 2nd picture was modified with the help of an unsharp mask to highlight some details. The simulation shows also the 46° tangent arcs (EE52), also knows as 46° lowitz arcs. Especially the lower middle 46° tangent arc (EE52B) is standing out. However, I neither saw these bows nor I found them in my pictures. The reason for that is the fact that my attention was directed to the area near the subsun. 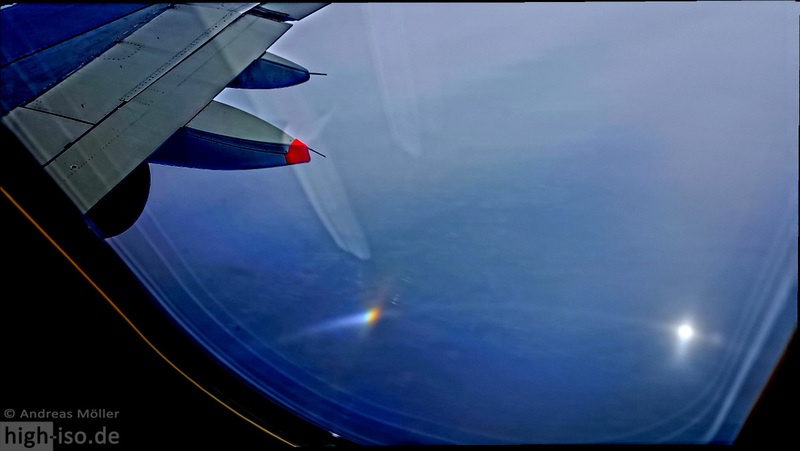 Another reason may be the fact, that there were no halo active ice crystals in the higher air layers. The simulation and the observation do match pretty well and are convincable, so that one can say, Lowitz-oriented crystals are responsible for the presented halo display. This picture was stacked from a video file. The frames were aligned and modified with photoshop. I want to thank Michael Großmann and Alexander Haußmann for helping me with the analysis. This entry was posted in rare cirrus halos, reflection halos, sub horizontal. Bookmark the permalink. In both simulations are two populations: non-regular plate oriented crystals, and regular Lowitz oriented crystals. The former made the sub-parhelic circle segment between the subparhelia, the latter the Schulthess arcs. 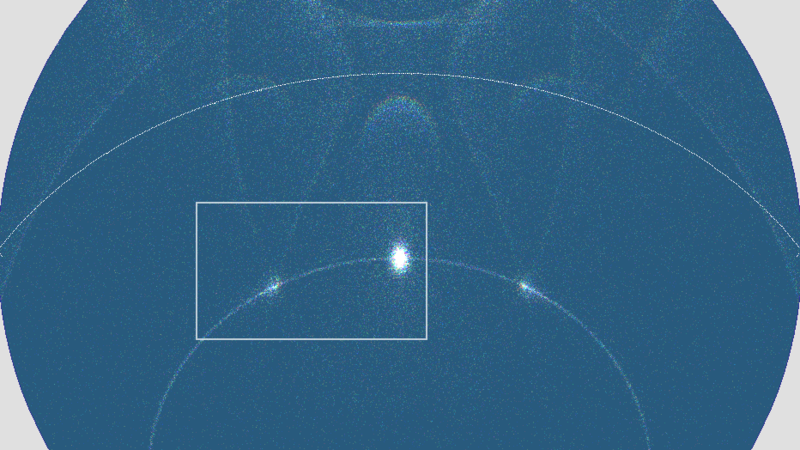 The Lowitz crystals had small tilts and made just short patches of Schulthess arcs which seems to be in accordance with the image. Also, these simulation do not have features of which existence might have proved an inconvenience had there been a full view of the display.